Staffan Bjorklund lives life to the fullest. 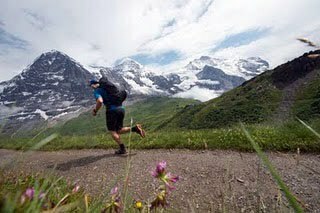 He skis, he climbs, he travels, and when he’s not leading hiking tours for Ryder-Walker, he competes in endurance races like the Ö Till Ö, dubbed “one of the toughest 1-day races in the world” by race organizers. Competitors in the Ö Till Ö, Swedish for “Island to Island,” traverse 19 islands in the archipelago of Sweden. They swim, they run, and they repeat, entering and exiting the frigid Baltic Sea nearly 40 times during the course of the race. 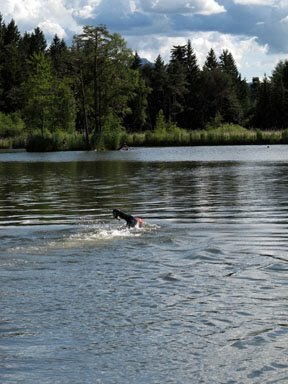 The event includes 10 km of swimming and 54 km of running. It takes discipline and a lot of training to enter a race like the Ö Till Ö, which is something that Bjorklund knows quite well. He’s been training for the race all summer, despite a heavy workload of guiding and research for Ryder-Walker. 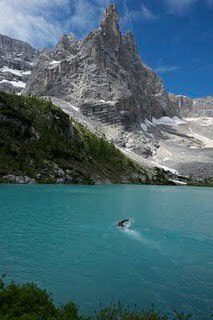 The guests on our Cortina and Lakes of the Dolomites Trek might remember Staffan grabbing a quick swim in the icy waters of Lago del Sorapis during an espresso break. Or maybe they recall him training between hikes on the Italian Dolomites Trek. Did they know that he slipped out after dinner for a midnight climb on the Tour du Mont Blanc? (It can be pretty dark out there without a headlamp). Here he is conducting research and training at the same time. (Those are the Eiger, Mönch and Jungfrau peaks in the background).